We ask our birds to live as our pets in a cage instead of flocking, foraging and flying free. In turn, they ask and need us to assume a lifestyle that provides them with lots of space, a social life, quality nutrition and enrichment. It is a daunting challenge for both companions -- the human and the parrot. 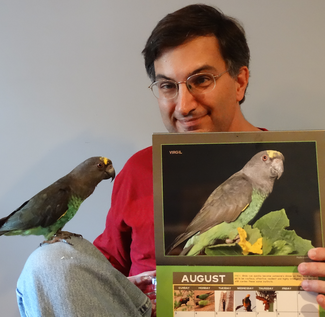 You won't find Phoenix Landing using the term "rescue" very often - since most parrots need a SUCCESSION OF GOOD HOMES, regardless of their background. Let's think of adoption as a positive way to go, and not burden parrots with negatively charged terms unfairly. After all, they are more adaptable and resilient than most other creatures on the planet! Most parrots are not able to keep their homes with their human companions for their entire lives. Very few parrots have "forever homes!" Even a small parakeet can live 15-20 years. If well cared for, the larger parrots can live for decades. It is essential that we acknowledge that parrots require multiple homes across their long lives. Shouldn't each home be a good one?? This is why adoption is an essential concept. when it comes to parrots. Sometimes people find their lives take unexpected changes. Others find the challenge of living with a parrot overwhelming. The most common reason parrots need new homes are because they require more time, resources or patience than someone can currently provide them. Phoenix Landing operates an adoption program to help find these parrots a new and committed home. We take responsibility for the birds that come to us for their entire lives, so if they need successive adopting homes, we will help to ensure these are good ones. Other birds live in neglect in houses or stores. Phoenix Landing acts as an advocate for these birds if possible, seeking to improve their lives or find them a better place. However, if a parrot has a good and healthy home, we hope you will consider not relinquishing your cherished companion. No relationship is perfect, and everyone goes through periods of stress or difficulty. If you need help, we offer lots of classes with information about making parrot care easier for you and better for your bird. Large parrots should live for several decades when cared for properly, and may live many years beyond their guardians. We must prepare for this possibility and ensure that our birds have a trusted place to go, should we die or not be able to provide proper care. Prepare for your parrot's future. Establish a trust fund or small insurance policy, make arrangements in your will, and tell the people closest to you what you want for your birds when you can no longer care for them. For more information about parrot trusts and estate planning, we highly recommend a link by Professor Beyer. Click here for his article. So many birds need new homes. Someday this could be your bird. You can help by looking out for your bird's future. You can also help by letting others know that adoption is an important thing to do for birds, since they have life spans that often far exceed more traditional pets. Very few people can take care of a pet for decades, and no parrot should have only one good home. Very few parrots have a "forever home" - this is a misnomer, and we need to take responsibility for a parrots differently from more short-lived companions. You can help educate people about this important concept. Let's make sure all our cherished birds have a good place to go, no matter how old they are or where they come from. Please tell people that adoption is the best way to help parrots!